Is Muamba collapse a wake-up call for football? 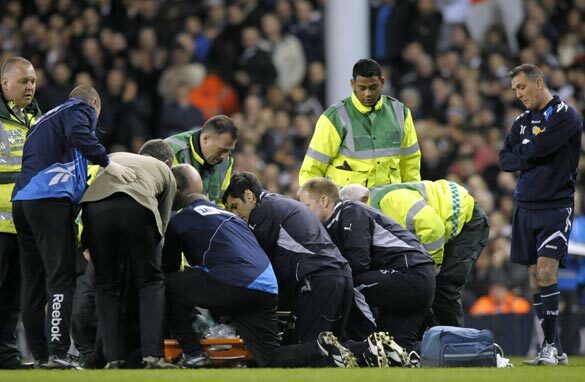 Bolton manager Owen Coyle watches on as his player Fabrice Muamba receives urgent medical attention at White Hart Lane. The shocking sight of Premier League player Fabrice Muamba collapsing on the pitch while playing in a match on Saturday should act as a wake-up call to the football authorities in England and across Europe. It has highlighted again that the standards and practices in place right now are not good enough to identify the type of heart problem which struck down the 23-year-old Bolton midfielder. They leave too much to chance - and let's not forget that the Muamba incident is just the latest in a series of tragic events which has seen high-profile players such as Marc-Vivien Foe, Miklos Feher, Phil O'Donnell, Antonio Puerta and Daniel Jarque lost their lives due to heart problems. As far as health testing goes, it seems the only time players receive an extensive medical is when they turn professional or when they are transferred between clubs, and I don't think that's good enough. England and all the other major leagues should take their cue from the excellent program in Italy, which I believe is the gold standard. In Italy, every professional footballer - indeed athletes across all sports - must undergo a thorough medical examination every six months at an official testing center. The centers are licensed by the Italian Olympic Committee (CONI) and the testing pays particular attention to the stresses placed on the heart by the incredible demands of modern sporting competition. This provides extra safeguards that aren't in place elsewhere, and the program's success is highlighted by the cases of Nigerian star Nwankwo Kanu and former Senegal international Khalilou Fadiga. Both had heart abnormalities that were only picked up by the CONI tests they were obliged to have while on the playing staff of Serie A club Inter Milan. Kanu stayed at Inter after having corrective surgery and went on to represent his country at the World Cup and enjoy a successful career in England, but Fadiga left the San Siro soon after his diagnosis without playing a match and joined Muamba's current club Bolton in 2004 when he passed a medical. But before he could play, the then 29-year-old collapsed before a match and had to be fitted with a defibrillator to regulate his heartbeat. He was advised to retire by specialists and, after making irregular appearances for the EPL side, was released in 2006. After the tragic passing of former Sevilla midfielder Puerta in 2007, there were calls for the European parliament to legislate and introduce standards of testing using the Italian model as a guideline. As far as I'm aware, nothing came of it - but the Muamba case highlights the need for urgent action. The medical treatment Muamba received on the pitch was obviously first-class. Extra medical facilities have been put in place at all EPL grounds since the horrific skull injury suffered by Chelsea goalkeeper Petr Cech in a match at Reading in 2007. I would like to see football's governing bodies and lawmakers use the example of the Muamba case to press for changes in medical testing that will try to ensure sure there are no more such incidents. At least then some good will come out of a potential tragedy which has united the world of football in wishing Muamba a speedy and full recovery. It is overtime the EPLand other football leagues in the world should adopt the Italian system of compulsory 6month test inorder to curtail this menance. This is a case where FIFA has to act and do what it has been prepared to do in other less important areas - lay down the law! After the Marc Vivien Foe tragedy there were calls for more stringent health screening of footballers and many fine words from the football authorities; sadly the rhetoric was not matched by deeds. A FIFA mandate is what's needed that requires all associations to provide compulsory bi-annual testing in order for players to be eligible for games within FIFA's jurisdiction. The various regional associations should follow suit, and funding should be set aside to help less wealthy organizations afford the cost of the tests. Domestic leagues should install similar requirements and stipulate that a set percentage of a club's revenue has to be spent on health screening. I see this as being in the same preemptive bracket as the introduction of crowd safety measures (like the all-seater stadia that resulted from the Hillsborough tragedy in England); and also in the same vein as UEFA's Financial Fair Play regulations which are designed to stop clubs killing themselves with debt. The players are the industry's raw material and, as such, the game's most prized assets, but they're also young men who should not be put at risk of dying for the cause. Therefore it's incumbent on the game's authorities to protect them by installing regular mandatory screening now! I really wish muanba speedy recovery. all foot ball fans in the world pray for your return in safe condition as normal. God bless the doctors who are actively with u through out activities in sake bed. thanks. With all due respect, the frequency of this happen doesn't warrant the drama of a 'wake-up' call. Would this article have been written had the match not been televised? Nothing needs to be changed, it just happened. Sure a heart-defect increased the chances of this happening, but how many players have had heart defects and played their careers without incident? I think the visibility of this one case is yielding a bit of overreaction and individuals are sounding off moreso to have attention drawn to their opinion rather than the issue itself. Was it the Italian system (CONI) that detected Antonio Cassano's heart condition earlier this season? I wish him the best and sincerely hope that clubs around the world do their best to take care of their players BEFORE crisis strikes. They work hard and need to be monitored. Prayerful wishes for a speedy recovery and good health to Fabrice. The writer obviously doesn't know that Fabrice Muamba was given a routine screening for heart defects in August and was checked again on the previous Sunday, with the test producing a "normal" result. The fact is that thanks to English medical staff he has come through. I wonder whether the result would have been similarly successful had the match been in Italy or anywhere else. Why should sporting bodies be charged with looking after the health of players? Where is the personal responsibility? This is not a problem we even need to be colncerned about, it is affecting less the 1% of professional sports players. The problem is that he had a heart attack on television, if it had been in the bath then we would not be having this discussion. Suicide, gambling,domestic violence and sexual offending are greater risks to sports stars yet the minimum level of support is giving to addressing these issues. Sports stars need to live up to the heroic tags that we place on them and take responsibility for their lives. Please press further! I am 100% sure Muamba had some encounter & message from his near death experience that will can help save many souls in this sinful generation. Hey people listen up! We are living on a borrowed time. Heaven & Hell is real! Repent now before its too late! Jesus is coming soon! God saved your life for a purpose, Muamba! Thank Jesus!